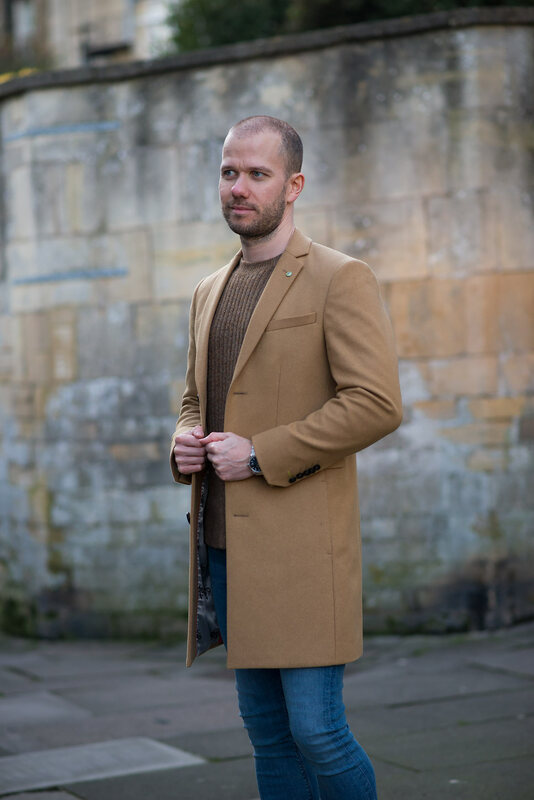 Nearly a month has passed since first acquiring my Noose And Monkey Camel Coat, in that short amount of time I’ve grown to appreciate its qualities even more; finding clothes that fit perfectly, especially coats and jackets is sometimes an unenviable task! 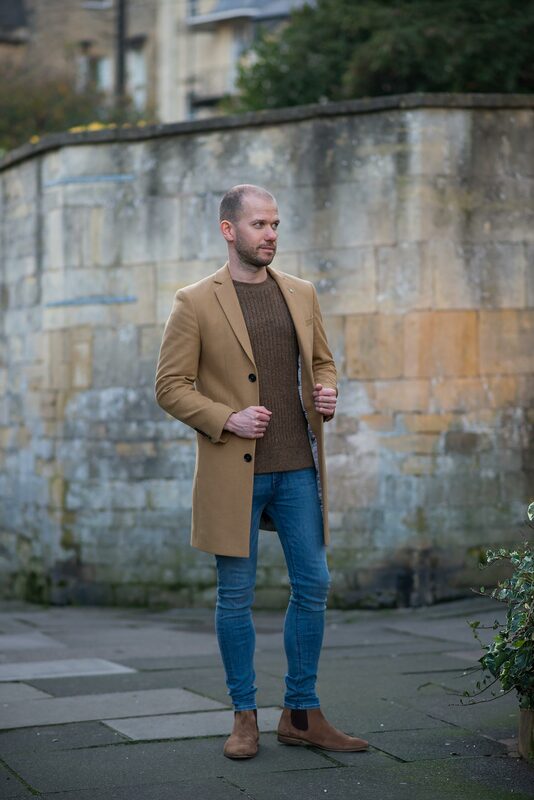 Now it’s time for a small confession, the photos for this outfit are not from a new outing, in fact they were taken simultaneously with my Noose And Monkey Hinton Camel Coat Review. So on this occasion I’m guilty as charged of synchronised time saving! The lighting was superb though, something we have to make the most of during the current climate. 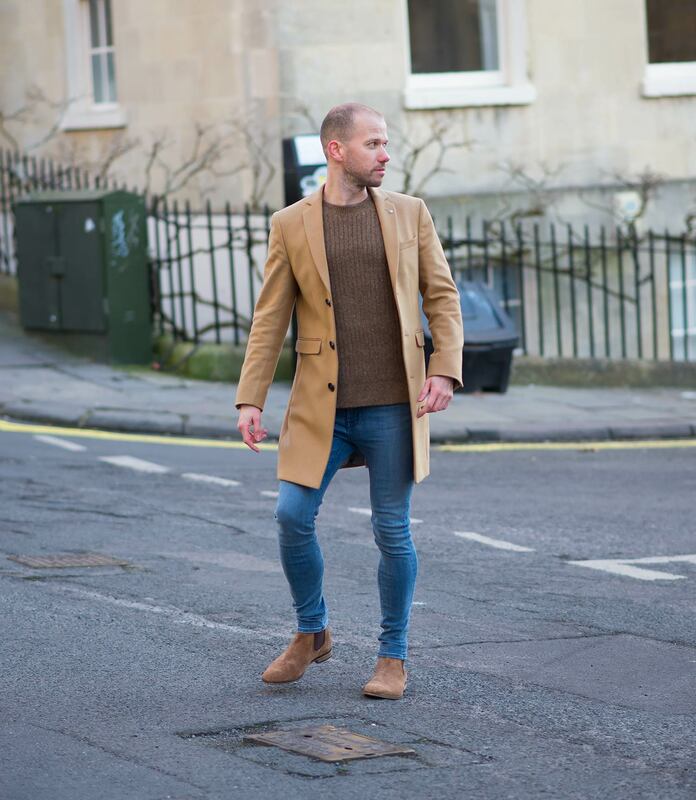 For the rest of the outfit on my men’s fashion blog, I choose my beautiful light blue Women’s Hudson Barbara High Rise Skinny Jeans In Hideaway Wash, which regular readers will note, are one of my favourite pairs of denim I own! 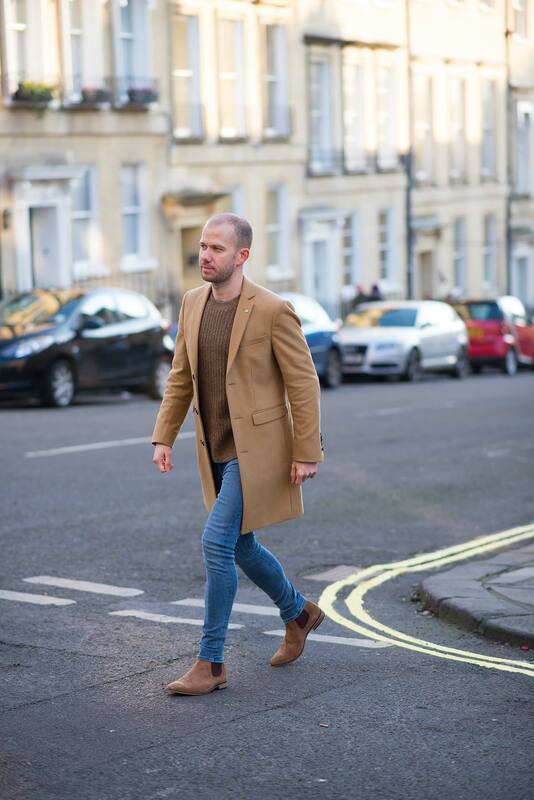 I decided I needed another pair of chelsea boots to compliment the sandy shades of the coat; thanks to the success with my Kurt Geiger Baxter Chelsea Boots I figured a tan pair from the same brand would be equally as prosperous. So say a warm welcome to the Kurt Geiger Harrogate Chelsea Boots, fit and quality is on par with its elder brother (although I actually needed to size up to a 9, the 8 was far too tight). 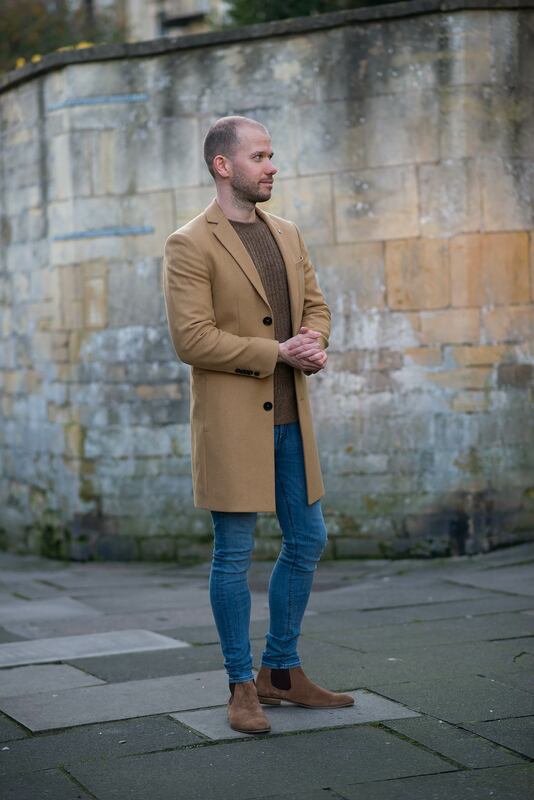 I completed the look with a light brown jumper from ASOS. Please let me know in the comments below your opinions and thoughts! Very stylish and taking skinny jeans to different level. I like that coat! Thanks very much! Yeah, I’m glad I gave the coat brand a try! yes, the whole combination looks great! I love your bog (hello from Australia, where we are not quite as adventurous, fashion wise), and this is a great combination. 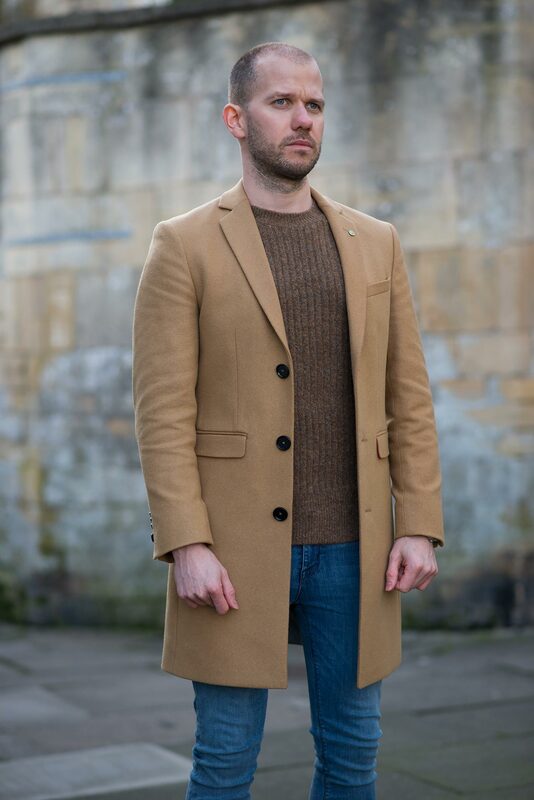 I normally stay away from any and all shades of brown, but may order this coat based on your post. It looks great. Hi Daniel, yes UK size 34 is a XXS. What size do you normally wear in clothes? Hi. I’m 186cm and 72 kg. I always vary between 48/50 normally. M or L. This one in 50 was huge. Mostly M fits great but the length of the arms is to short. I’m a bit critical on that. I wonder that an XXS fits you. Isn’t it really super small and short arm length? I’m 5 Foot 8 Inches and around 11 stone. But, XXS in this coat is fine, fits just right and the sleeves are great. In fact a lot of brands, the sleeve lengths are inevitably too long on me usually. Being a size 31-32 waist, 32 inseam, what size would I get in those or the other darker wash jeans? What type of legs do you have? slim or muscular? My legs are pretty slim and my normal men’s jeans size is 30-31 and I wear 26-27 in women’s jeans. This does depend how tight you want them to fit also! I’m average size legs and usually wear 31-32 jeans. What are your 3 favorite skinny jeans that would work and any that are low rise? My favourites change from week to week and also low rise isn’t really my style anymore, so I wouldn’t really know what to recommend. Ok, so assume mid-rise jeans and a size 31 in Diesel, 32 in others, but need 32 inseam to wear with chelsea boots. Assume not too tight – more skinny than the super skinny look and fit. Thanks for all your help and great looks. Just wish you had a site to sell direct to us! It is a bit tricky, many of the women’s skinny jeans I wear are quite a lot shorter. Some are only around a 29-30 inseam. A lot of J Brand skinny jeans I’ve tried do actually run a lot longer, the seriously black pair is more like a 31. You may be better off sticking to the slimmer cuts of Diesel, or perhaps even Nudie? Adam, I agree, though am a bit disappointed. My next encouragement for you to help us – skinny pants that are non-jeans. Hoping that is easier to find in longer inseams! Most likely that will be closer to the end of the year, as it’s warmer temperature at the moment I’m barely even wearing jeans! I do plan on trying various skinnier standard trousers at some point though, they do have longer inseams but I’ve found are never as skinny as I like! Great look! I like this combination of colours very much. 😀 Also I think this is a terrific set of photos – I especially like the ones with the brick wall as background. That wall compliments the outfit too. Thank you! 🙂 Yes, this location is great, nice background and has the added bonus of never being particularly busy either! So its ideal for photos! So in trying to find jeans that fit online (ebay, grailed, etc. ), what do you look for to match my waist (32) and inseam, as girl jeans will show a different waist size? I’m a 31 in Diesels to compare, thus what size would I look for? I see the Citizens of Humanity jeans on ebay, but hard to tell if the seller doesn’t list the waist measurements laying flat. Thanks for all the great postings photos and help for the rest of us guys trying to dress equally as cool as you! Hey! Well, for Diesel I generally wear a size 30 or 31. But for women’s jeans I wear either a 26 or a 27. However you may need to try and get jeans which have a longer inseam, in mens I need around a 30. A lot of women’s jeans are 29-30, but I find J Brand is slightly longer on me, so perhaps try those? Great info! As a US macho guy, the main challenge is feeling weird going to find and try these on. Otherwise great info!